There are no lengthy catalogs, no mailing lists, just fonts, and sick fonts with no socially redeeming value, True Type Fonts made from the handwriting of infamous killers! Not for a minute do we pretend to have any tact. Just good old fashioned bad taste and irreverance, which you can be a part of! Besides having the cojones to produce something of such poor taste, we have the engine which allows you to buy them on-line and have them ready to use and offend in minutes! Not only do you get the whole alphabet, you get the ENTIRE ASCII SET with each font (sans a few math symbols) available in both Mac and PC versions. Each Font has a large array of bitmap sizes and a complete set of FOREIGN ACCENTS, DIACRITICS and many of the frequently used embellishment characters. A portion of all profits from Killer Fonts sales will go to charity. Coming Soon! Butch Casssidy, Billy the Kid, Jeffery Dahmer and the Gainsville Ripper. Copyright © 1996, Digital Download Inc. All rights reserved. No portion of this document may be reproduced or copied in anyway. 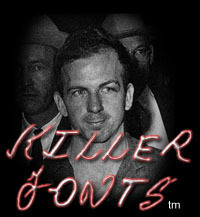 Killer Fonts is a registered trademark of Digital Download Inc.